Who’s your daddy… And momma? 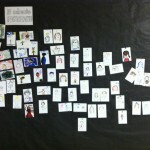 The 4th graders created five minute portraits and during Open House parents did the same… Can the children guess which one is their parents? One Response to Who’s your daddy… And momma? Look at all that artistic talent! Now we know where the kids get it from. Great job artists, and great idea too Siobhan. Thanks for a fun activity.